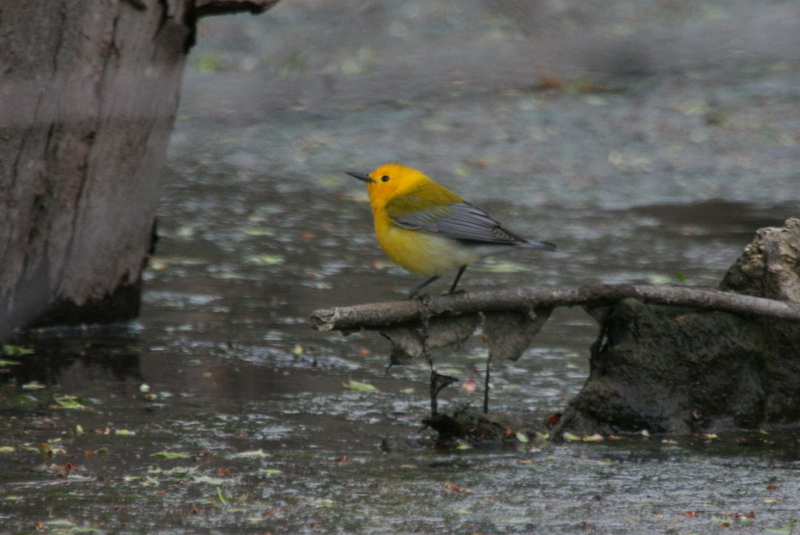 I found a beautiful yellow swamp warbler, aka PROTHONOTARY WARBLER at Deer Run Forest Preserve. Location of bird: Take the trail that heads through the field off the horse trailer parking area and go right. Continue along the path by the prairie and farm field to the east, looking for SAVANNAH SPARROW along the way. Stay right when the path splits and you’ll still be by the farm field (not forest preserve property). Here I had a LARK SPARROW. Next the trail will curve to the left after a ways and then split again – go left. I had two singing OVENBIRDS here. Just follow this until the path is flooded completely with running water. Great day to be out! Several new birds for the year for me!! Also had a Northern Rough-winged Swallow along the river by the parking lot. UPDATE: Forgot to add that I had my first of year Gray Catbird as well. Went on the bird walk led by Marjory Rand at Spencer Park in Boone County. Despite the howling wind, we found a lot of cool birds. First of season Chimney Swift, Rose-breasted Grosbeak and Palm Warbler. Over the river an Osprey circled holding a fish. At Oak Ridge (entrance from Perryville Road in Winnebago County) I found two Black-throated Green Warblers on Friday at lunch time. Spring…a beautiful male at sunflower feeder this am! Yeah spring!! After I saw the great birds posted by Larry Balch and Eddie Callaway yesterday, I had more than a hunch that I would be birding in the Shirland area today. Started on Meridian Road between IL 75 and the Pec River bridge. Nice shorebird numbers in the flooded field, including 106 American Golden-plovers. Most were still barely molting, but a few were quite spiffy. Also there were Pectoral and Least Sandpipers, plus both species of yellowlegs, and a smattering of ducks, including both Lesser (6) and Greater (2) Scaup. Next to Moody Road, where Larry and Eddie both reported a nice mix of birds. More Golden-plovers in the flooded area at the east end of Moody Rd (but the light was terrible with bad glare off of the water). There was a large flock of ducks in the flooded farm field just north of the road, where I estimate there were 180 Northern Shovelers, almost 100 Blue-winged Teal, and several Gadwall and Wood Ducks mixed in. The Lark Sparrows found by Larry at the end of the gravel drive on the south side of Yale Bridge Road west of Boswell Road yesterday had considerately moved up to the brush pile at the junction of the road and drive, so I didn’t have to go more than 20 feet down the road before I was looking and listening to them at close range. Have no idea if there were still more at the end of the drive where Larry had them. 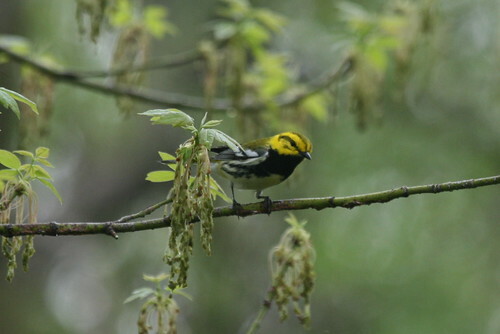 The Yellow-throated Warbler seen and heard by Eddie et al. yesterday was joined by a companion today–I found 2. One at the River View shelterhouse and another down by the Sand Bluff shelter. Also head my first House Wren of the season there. Saw and Orange-crowned Warbler there, plus several of the Pine Warblers seen there yesterday, but not 9. Also heard or seen there were a Pileated Woodpecker, Red-headed Woodpecker, 4 flying Sandhill Cranes, a migrating Osprey, and a calling Red-shouldered Hawk. 3 Great Egrets were standing on nests in the Great Blue Heron rookery that is visible from the intersection of Pecatonica Road and Blair Road. Got home and Barbara reported a telephone hotline message about 6 Am. White Pelicans on Rock City Road north of Ridott and before the Pec River. Thanks Gee Gee Swing and Joyce Armstrong for your calls). Drove over there and saw the pelicans. Found a bonus bird when I decided to drive River Road back east to Farwell Bridge Road. Turned south on Farwell Bridge Road to head back to US 20. Just before reaching the intersection with Ridott Road, by a very old cemetary, there was a Loggerhead Shrike perched on the wire! Thank you to whomever found and reported the pelicans to the NCIOS calling tree. Barbara and I were assigned to the Max McGraw property at the end of Wiegert Road east of Pecatonica. We had 5 pairs of Sandhills unison calling. Other notable birds was a Green Heron (first this year), calling Soras, a Virginia Rail, adult Bald Eagle, two Great Horned Owls and a Barred Owl calling before dawn, winnowing Wilson’s Snipe. After we met Jack and Joyce Armstrong for breakfast in Pecatonica, we saw 3 Great Egrets north of town on Pecatonica Road. The Pec Wetlands are still quite flooded. Howard’s farm had a lot of Savannah Sparrows. Back at the house, we had our first Pine and Orange-crowned Warblers and a Blue-gray Gnatcatcher. We (my dad and I) had Moody Marsh for the Crane Count and were not disappointed with cranes. We had 13 cranes calling, 6 doing the unison call, and a flock of 21 flying over. (Later we counted ~40 in same place as Larry Balch). Other birds at our count area: 2 Soras, 2 American Bitterns, tons of pheasants, Bufflehead, Hooded Merganser, Ring-necked Duck, Wood Duck, Northern Shoveler, Ruddy Duck, and 80+ Blue-winged Teal. (Most of the ducks were in the flooded fields along Moody Rd). Afterwards we headed to Sugar River Forest Preserve where we had a singing YELLOW-THROATED WARBLER and 9 Pine Warblers. A couple Brown Thrashers, & Eastern Towhee. At home in the yard we had a Brown Thrasher and a House Wren to bring our total day species total to 60. My ICF Crane Count area was the 1.5 mi x 1 mi rectangle southwest of Yale Bridge Rd and Boswell Rd. Among the birds I recorded in the 2 hours I spent there were several winnowing snipes, a flock of 31 turkeys, four Brown Thrashers, and five sparrow species. Along a 0.3 mile-long gravel road that goes south from Yale Bridge, 3/4 mile west of Boswell, there were Vesper Sparrows at the beginning and two Lark Sparrows at the end. Field Sparrows were everywhere. On Moody Road there were 41 Sandhill Cranes. Near the end where it turns south, I recorded 16 species of waterfowl, including large numbers of Ruddy Ducks. There were also Horned Grebes, half a dozen Bonaparte’s Gulls, both Yellowlegs, Pectoral Sandpipers, and a flock of 12 American Golden-Plovers, hard to spot far away. Much easier to see right next to the road were the two dozen American Golden-Plovers on Meridian Road, just south of the Pecatonica River. Dozens of Pectoral Sandpipers and both Yellowlegs were also there. ON 03/15/08 I noticed cocoa mulch “flying” near some hydrangea bushes. Surprised to see a Brown Thrasher foraging for abt an hr…then left not to be seen since. Broad-winged Hawks nest every year (since 2002 when we moved here) in the Shaw Woods part of Rockford where I live, and today two of them were perched in my yard, and chasing each other about. As Dan Williams noted on Sunday, the pace of migration is picking up. OK, spring migration is finally beginning to arrive with substance in northern IL. Barbara and I drove from Pecatonica to Ridott this morning. We were blocked at two points by flooded roads. Maize Road, just east of the Blair-Goeke-Maize Road intersection, is under water. No signs are posted because, I suppose, the people using that road are driving pick up trucks. I recommend that you detour unless you have high clearance. The other closed road is the one that runs west out of the south edge of Ridott. At least they marked it. The Pecatonica River valley is really flooded. Most numerous bird is American Coot–there are hundreds of them all over the place. Lots of ducks, too, but spread out. Largest variety in one spot was along Rock City Road between Ridott and the bridge over the Pecatonica River. Also a lot of Pied-billed Grebes, and one Great Egret at Pec Wetlands FP. Swamp Sparrows are in every brush pile and thicket along Blair Road. This afternoon, Barbara and I hiked the loop trail around Anna Page Park. The woods was full of Hermit Thrushes (18), lots of both species of kinglets, a number of Yellow-bellied Sapsuckers, lots of Yellow-rumped Warblers, and our first Winter Wren of the season. Chipping Sparrows are beginning to arrive in flocks. Several were singing around our neighborhood this morning, adn a small flock was seen in Stephenson County along the roadside.